Say you’re in the Civic Center, or hoofing it through the Upper Market, or just trudging down from a perfect parking spot somewhere in the grey zone of the Tenderloin towards some bit of City business. And let’s say you’re hungry, too. Though the neighborhood is quickly gentrifying—a few blocks Westward is a new Twitter headquarters, and just East, a brand new shopping center is promising to break ground—the place still smacks of urban grunge. Just a handful of years ago, Mid-Market was not on the radar, and it still clings to its gritty vibe. 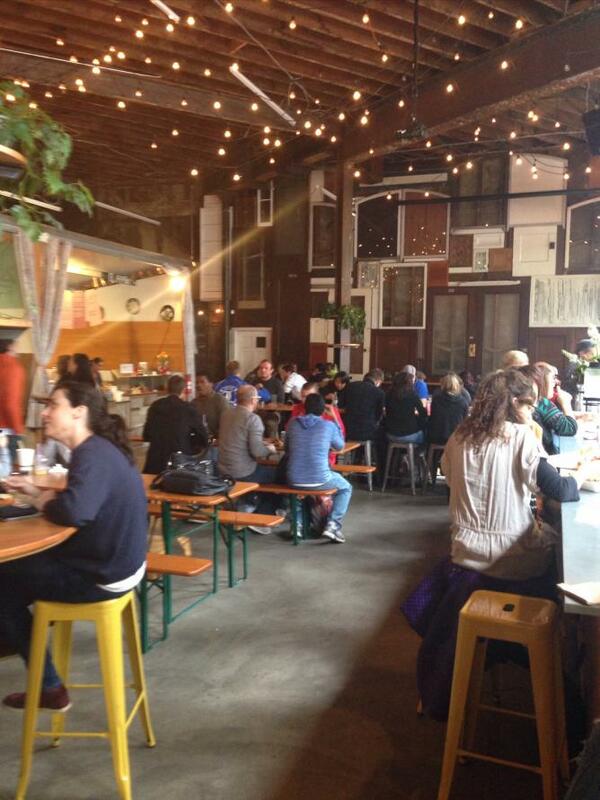 So who would guess that an oh-so-cool spot for lunch or dinner would plant itself squarely in the middle of the mix? That’s exactly what the purveyors at The Hall have done. Smart business says there’s absolutely no competition in the close-in neighborhood, and that’s a plus, but what’s really stunning is how cool-and-groovy the place is once you step inside. The feel is pure and sweet urban foodie culture, like stepping into the Cowgirl Creamery at the Ferry Building. 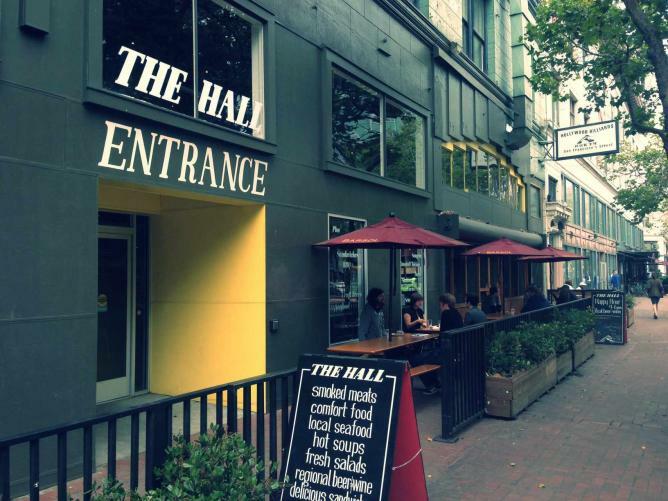 The idea is simple: The Hall brings together an amazing array of what we might usually consider street food, but centered in one wood-and-metal designed open-air restaurant space. Belly up to any one of the counters, and you’ll leave the long lasting impression of a mall-centered ‘food court’ behind in the dust. This is urban. This is cool. This is delicious. Though the room is surely arty and atmospheric, it’s all about the food. Street food brought inside, just for you. Here are your choices: Cassia—a Peruvian and Morrocon-blended cuisine; Little Green Cylco—Vietnamese sandwiches and soups; Fine and Rare—Cobb salad and seafood; Raj + Singh—Indian curries and samosas; and The Whole Beast—lamb, beef, Charcuterie and salads. We tried a mix of everything we could get our hands on in one midday visit. Here were our votes for standouts: The steak salad and kale salad at The Whole Beast; the Naan Wrap filled with curry at Raj+Singh (samosas were terrific, too! ); the shrimp Louie at The Crab Shack, the Phở Tái Nạm noodle and beef bowl at Little Green Cyclo; the enchiladas at El Pipila; and the Moroccon sweet potato salad and white bean and fennel salad at Cassia. (We also tried the braised pork shoulder at Cassia, but it needs a little update: Served in a coconut milk broth with herbs and spices, the meat is almost ground, and would serve up better had it been crispy-grilled or pan-fried in strips before adding it to the mix.) A lovely bar lines the front of the room, and diners can pull up a chair or a table anywhere in the place with effortless ease, even during a busy lunch hour. Tuesday evenings feature live music, which rounds out the whole City scene—casual, cool, arty, and easy. The Hall is totally worth the visit, particularly if you’re in the region. It’s an oasis in the midst, a little den of food pleasure, and one you’ll want to keep in your restaurant cache next time you’re hitting the ‘hood.